Jay Naidoo – a former trade union leader and minister in President Nelson Mandela’s first cabinet in 1994 – was the guest speaker at the national launch in Johannesburg recently of Beverley Naidoo’s biography on Neil Aggett – “Death of an Idealist – in search of Neil Aggett”. Speaking off-the-cuff, from short notes, his talk was both deeply insightful and somewhat inspiring, given the recent tragedy of Marikana. 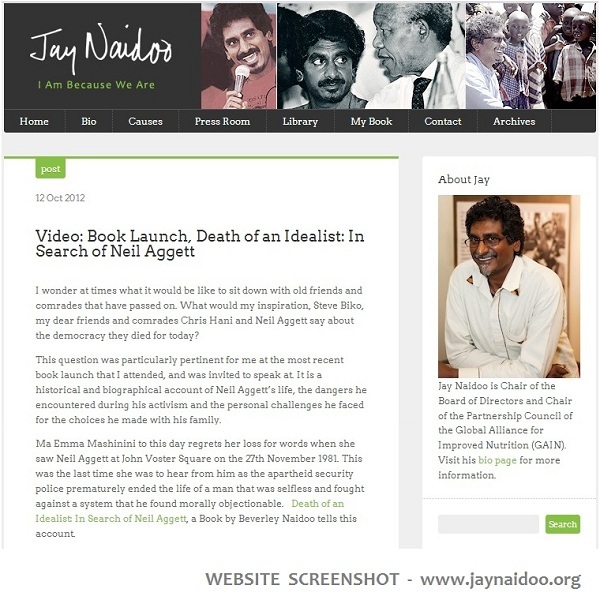 The full, 10-minute video clip of this talk on 09 October 2012 can be found on Jay Naidoo’s website, pictured above. I’ve done a transcript of this talk, because I think it is important – at this time of civic unrest in South Africa – that his words gain wider oxygen.